Canada is no stranger in dealing with oil price collapses. The sharp fall in the price of crude in 2014 is not unprecedented. Over the past 30 years, there have been five major declines in the price of crude that have hit world markets ----- starting dates : June 1986, October, 1990, October 1997, May 2002 and June 2008. The plunge in prices has ranged from 25% to 60%. In all cases , Canada, as an oil-exporting country has had to bear the brunt of these precipitous and severe price declines, in terms of loss production, loss income and downward adjustments in its exchange rate and balance of trade. * A rapid and significant increase in supply ; 1986 featured the full expansion from new fields in the Gulf of Mexico and in the North Sea ; in 2014 the glut was caused by huge surge in production from unconventional sources such as oil shale in the U.S.
* A major shift in OPEC policy . In 1985, OPEC abandoned price targets and stepped up production by about 30% , the resulting low price remained in effect for nearly two decades; OPEC took a similar position in November 2014 by increasing supply and dropping prices to stem further losses in its market share; no longer will OPEC abide by price targets. * Worldwide a fall off in demand; in the early 1980s, the recession reduced demand and this contributed to lower oil prices. Today, oil demand has been slowing steadily since 2012, especially in the larger emerging markets. * A steady rise in the US dollar ; a rising US$ raises the local currency cost of oil ;the effect is to weaken the demand for oil. Oil price drops of such magnitudes result in real income shifts from oil exporters to oil importers, Oil exporters have to then contend with fiscal imbalances, a decline in oil production and new investment, weak growth and foreign exchange adjustments We now turn a review of how Canada coped with these adjustments in the mid-1980s and what lessons can we learn regarding the adjustments needed today. The Effects of Falling Oil Prices. In oil-exporting countries, lower oil prices trigger currency adjustments, a re-pricing of credit and sovereign debt risk, and fiscal stimulus measures. Sudden price drops increase uncertainty in oil sector investment and in other goods-producing sectors. In sum, throughout the economy, capital investment is reduced or delayed and overall growth is diminished. Thus, both monetary and fiscal policy are called upon to support growth . In response to the drop in oil prices in 1985, the U.S. Federal Reserve began a series of interest rate cuts to ward off the effects of slower economic growth and disinflation. Globally, economic growth slowed, especially in Japan and Europe. 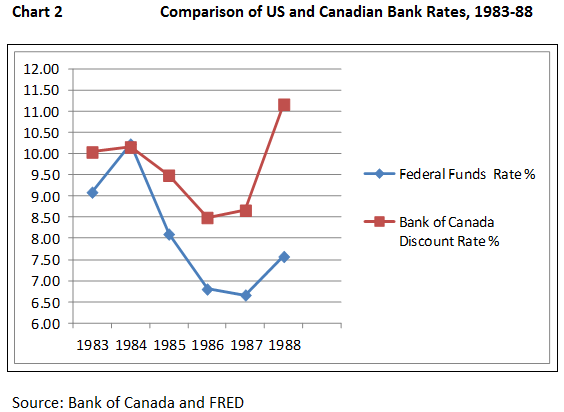 Canada followed the US lead in slashing its discount rate (see Chart 2 ) The US rate action was more aggressive than Canada's , in large part because Canada needed to have higher interest rates in order to attract capital inflows .Canada has traditionally been a capital importing country, and with its major export sector under duress, capital imports needed to be encouraged. In both countries, there was sufficient room to reduce interest rates, given that short term rates were at 10% or more prior to the collapse of oil prices. This was an important buffer that allowed an orderly adjustment to the changed circumstances regarding growth, investment and the balance of payments, respectively. Alas, as we will discuss later, no such buffer is present in today's world. Canada and the US were running government deficits in response to the sharp recession of 1980-82. As Chart 3 reveals, deficit financing continued in response to the oil price shock of 1985-86. 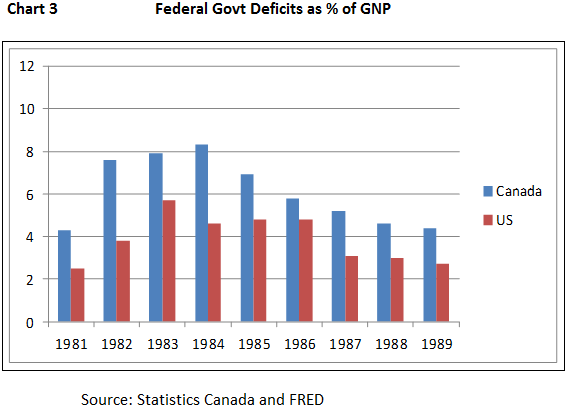 Canadian government deficit was 6.9% of GNP in 1985 and remained at 5% for the next three years. Interestingly, the governments of the day were working with quite difference in philosophy. The Liberal Government expanded its domestic programs ,while the Reagan Administration advocate smaller government; in both countries, the effects of the oil shock were tackled in the same way, namely through government deficits. 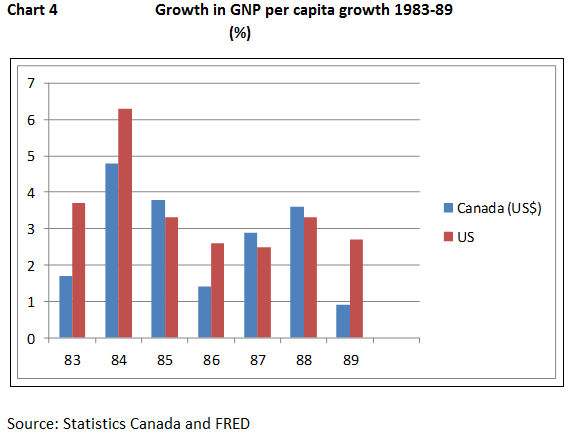 Chart 4 compares the growth per capita in the US and Canada during this period. Both countries were coming out of the 1980-82 recession with strong growth ; the US recorded real growth of 6.9% and Canada , 4.8% , in 1984. 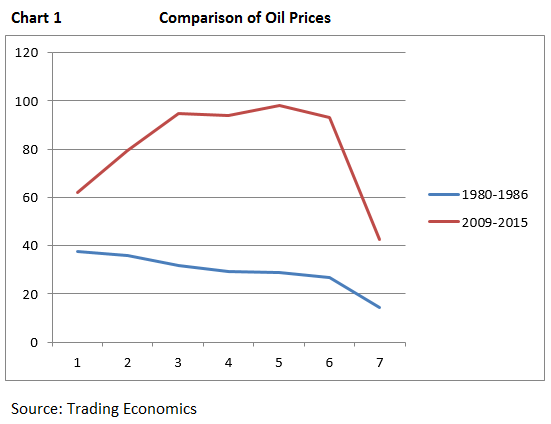 The oil price shock hit both countries, although Canada was hit harder in 1985 when growth dropped to just 1.4%. Without the accompanying monetary and fiscal stimulus, the results would likely have been worse. The Canadian currency took a tumble when oil prices plunged in 1985-86. The loonie dropped in value from 85 cents US in 1980 to 71 cents US in 1986, when the oil prices reached their cyclical low. 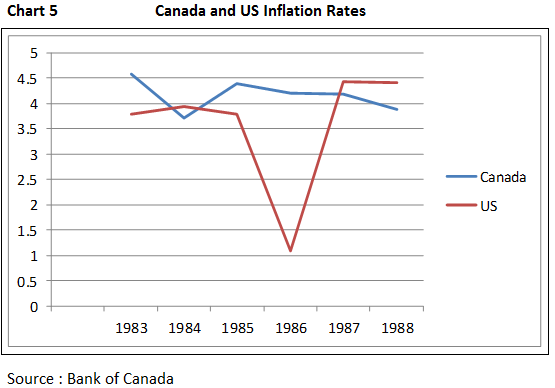 As result, Canada was not able to take advantage of the worldwide deflationary effects . The US, on the other hand, saw its inflation rate drop to a low of 1.1% in 1986. This is the perennial question when making comparison with the past. In our case, there are two things that stand out in answering this question. First, the speed with which Canada was forced to adjust to the plunge in the price of oil price today is much faster than was the case in the mid-1980s. In the 12 months from June 2014, the Canadian economy slowed dramatically, recording 6 straight months of contraction in GDP. Within the sectors the goods-producing sectors contracted by 2.9% annualized; oil and gas, by 4.9%; construction, by 3.1% and manufacturing ,by 1.7%. This was a swift reversal of fortunes. Not unexpectedly, the balance of trade moved from a healthy surplus to a huge deficit in the first 6 months of 2015. And, reflecting all this rapid change, the loonie fell 20% in the first half of this year. Canada went from one of the best performers in the G-8, to one of the worst in quick fashion. An OECD forecast released this week, anticipates that Canada's GDP will grow at 1.1% per cent in 2015, down considerably from its June forecast of 1.5% growth. Matters have deteriorated rather quickly. Second, Canada does not have adequate tools to counteract these negative effects. The Bank of Canada has already cut the bank rate twice since January ,2015 ; it now stands at 0.5%, leaving very little room to cut further. We are now " pushing on a string" with regard to monetary stimulus . The only remaining weapon available to stimulate growth is adjustments in the international value of the loonie ( see http://soberlook.com/2015/09/canada-joins-currency-wars.html). Now that the currency has depreciated nearly 30% over the past 2 years, the Bank of Canada has argued that the economy will return to positive growth in the latter part of the year and into 2016. The jury is still on this forecast, especially in the context of currency adjustments taking place throughout Asia and Europe ,as countries jockey for a competitive advantage in a world where trade is slowing rapidly. Turning to fiscal policy, a recent Conference Board of Canada forecast anticipates that the Federal government alone will lose $4.3 billion in revenues from the oil patch--royalties and income tax, calling into question the prospects of a balance budget for fiscal 2015. Alberta is expecting a decline in GDP of 5% which will impact heavily on provincial revenues. The Conservative government has introduced a balanced budget for 2015-16 and promises to continue this policy if re-elected. The NDP also promise a balanced budget. Only the Liberals call for deficit financing , albeit their deficits would be relatively small in comparison to the size of the Canadian economy, and not nearly the size of those experienced in the mid- 1980s. Overall, deficit spending to stimulate growth is not a top priority in Canadian politics . And, with monetary policy exhausted and with fiscal policy operating with one hand tied behind its back, Canada continues to remain vulnerable to the plunge in oil prices. All these developments in Canada are taking place within an environment of a global growth slow down, declining inflation and currency devaluations as Asia and Europe cope with weakness at home. Thus, the outlook for a return to growth is far from promising.